The base design is by Sara Felix and Vincent Villafranca. As reported earlier, Marjorie M. Liu and Sana Takeda once again won the Hugo Award for Best Graphic Story, for Monstress, Volume 2: The Blood. The creative team won it last year for the inaugural volume, and the analysis and voting data can be found in my report from last year. 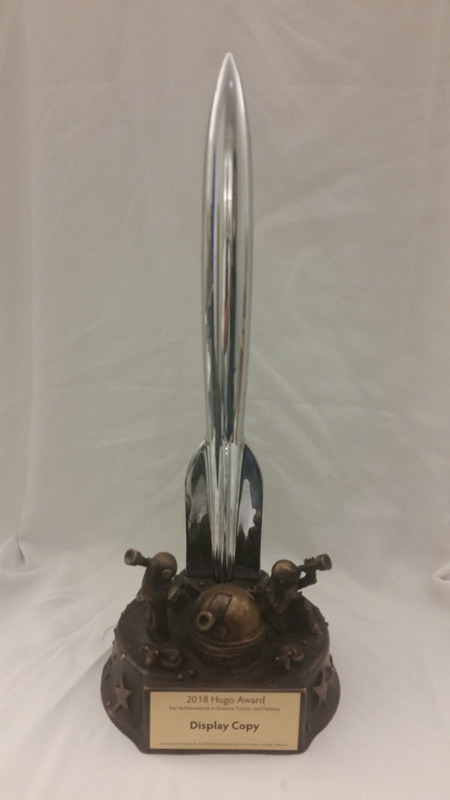 The Hugo Awards are a fan award, voted on by anyone purchasing a membership to that year’s Worldcon. The 76th Worldcon, which rotates geographically each year, was hosted last weekend by San Francisco Science Fiction Conventions, Inc. in San Jose, California. Again, science fiction fans are wonky, and the voting system is different from others… Voting is preferential, in that all nominees are ranked by the voters, including “No Award”. As you’ll see below in the matrices, votes are counted, and the least-popular nominee is eliminated, and those ballots are then recounted, with emphasis placed on the second-place titles. (“Hey, our choice didn’t win, but here’s who we would have picked for runner-up.”) This continues until a winner is determined, and the cross-checked against “No Award”. Then, it starts all over, with the winner being ignored, the votes tallied to determine with winners for the remaining places. You might think that the initial tally would predict the final order, but as seen below, Black Bolt, Volume 1: Hard Time placed third in the first round of voting, but ended up as fourth overall. Another interesting bit of data: Monstress, Volume 2 was not as popular as Volume 1. 2,828 valid ballots cast. 25% cutoff = 708 voters. 1,393 valid ballots cast in category. Looking at the “Preference” data, you can see how the aggregate voters cast their ballots. Everyone voted for First Place (with 73 voting for No Award), but only 812 (53%) filled out a complete ballot. It should also be noted that of the 2,828 total ballots submitted, fewer than 50% voted in the Best Graphic Story category. Is this because Hugo voters (WorldCon attendees) are older, and not as cognizant of the diversity of graphic storytelling? Is this because many comics publishers aren’t campaigning for votes via the reader packet? (This is a digital download available to all Worldcon attendees, containing excerpts and full texts of nominees, offered by the publishers.) Large publishers do not exhibit at Worldcon; it’s unknown if it’s worth the trouble, given a general attendance of 10,000. Granted, those attendees include industry professionals and ardent fans who read a lot of fiction. Well read and educated, the quality of fan is higher than most shows. Along with the above voting data, the Hugo Awards committee also releases the data on nominations. Note that both Ms. Marvel and Saga had two volumes on the long list. Note that Image had four of the six finalists, and six of the fifteen longlist. Publishers and creators should note: A supporting membership to Worldcon 76 cost $50. For that, members could nominate and vote for the 2018 Hugos, and nominate for the 2019 Hugo Awards. Theoretically, for $2000, a campaign could get a group of titles on the final ballot. Of course, with the new voting restrictions on slate ballots, a publisher would have to randomize the titles on each nominating ballot. Or the publisher could campaign for the next year by buying a table in the dealer’s room, promoting current and upcoming titles, and creating a website just for Worldcon attendees where members can read everything online. In 1988, when Watchmen won the Hugo Award for Best Other Forms, there were 418 nominating ballots. Voting data isn’t readily available (was it published in Locus? ), so it is not known how many nominations were received for the somewhat obscure “other forms” category, or how works were defined or categorized by the Awards committee. Still, it doesn’t take much to get on the final ballot, or to win. Other Forms wasn’t just “somewhat obscure”; it was a one-shot setup. The mid-80s was really the first time comics works that had the potential of getting Hugo nominations were coming out; Dark Knight Returns, Watchmen, etc. But there were folk who thought either comics were worthy of a mainly prose based award, or who had genuine problems with solely prose stories competing with prose/pictures stories as apples and oranges. One solution was what was done with Dark Knight in 1987; it was in “Best Related *Non-Fiction* Book”. No, the admin didn’t decide that Batman was a real person; it was considered an art book (I’ve heard the story that a prominent person in the SF field was asked for their opinion, which amounted to “It has pictures, so it’s an art book”. IMO, this was really stupid). But for the 1988 Hugos, it was pretty clear that Watchmen would be getting nominations in the fiction categories; people were posting word counts, which is how the four categories are distinguished. So the con decided to create, as was their right, a one-shot Hugo category. No future Worldcon would be under any obligation to repeat it. And the examples of possible “other forms” included comics. So you got this mess as nominations; Watchmen, Cvltvre Made Stvpid, Tom Weller (humor book), The Essential Ellison, Harlan Ellison (Best of collection), “I, Robot: The Movie”, Harlan Ellison (unproduced screenplay), and “Wild Cards” series, George R. R. Martin, ed. (superhero anthology, but all prose). Let’s just say that Watchmen was a substantial favorite to win. In summary, Other Forms existed as a combination way of getting Watchmen out of the traditional prose fiction categories and getting as close as they could to making sure it did get an actual Hugo. Oh. These are the “well read and well educated fans/higher quality fans” who attend this convention. The demographics of the Worldcon used to skew old, but I don’t know if that has changed in the last few years. But I think the important factor is that people who attend the Worldcon are primarily fans of written SF&F, not of comics. There will be overlap, of course, but it’s not surprising that most of them do not feel qualified to vote in the graphic story category. Also, there has been a lot of political undercurrents in the Hugos lately, and I wouldn’t be surprised if a number of those who did vote followed the perceived politics of the works rather than their own knowledge/enjoyment of them. Thanks for these contextual insights into the Hugos. I had no idea about the fan-nature of them. Some Hugo winners I have liked, like McMaster Bujold (and Elizabeth Moon, if she’s won one), but Nebula winners are distinctly different again – less space-opera, perhaps Cheers!